David Healy was born on 5 August 1979 in County Down, Northern Ireland. He has been a prolific scorer for his country but despite this he has not quite managed to carve out a commensurate career at club level. Healy was spotted playing for the Down Academy High School and had also starred for Northern Ireland's underage teams. David Healy signed for Alex Ferguson's Manchester United in August 1999 soon after United's historic treble of Premier League, FA Cup and Champions League. David Healy made his Manchester United debut on 13 October 1999 against Aston Villa. He came on as a substitute in this League Cup tie which Villa won 3-0 at Villa Park. The problem for Healy was that United had four excellent international strikers ahead of him, Andy Cole, Dwight Yorke, Teddy Sherringham, and Ole Gunnar Solksjaer so breaking into the first team was a tall order. David Healy went out on loan to Port Vale early in 2000 to gain some first team experience where he scored three goals in 16 appearances. After his return to Old Trafford he was used as a substitute in another League Cup tie against Sunderland on 28 November 2000. Once again he was on losing side as Sunderland won 2-1 at the Stadium of Light. David Healy's last appearance for Manchester United was at Old Trafford in a Premier League match against Ipswich Town on 23 December 2000. He came on as a 59th minute substitute for United legend Ryan Giggs. In his third and last match for United he was finally on the winning side courtesy of two goals from Solksjaer. In January 2001 David Healy transferred from Manchester United to Preston North End for a fee of £1.5 million. 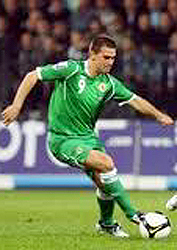 David Healy made his international debut for Northern Ireland on 23 February 2000 against Luxembourg. He certainly started off his international career as he intended it to continue - by scoring two goals in a 3-1 win in Luxembourg. Healy now has a scoring record that is a match for the very best international records although eight goals in his first 29 matches was not all that impressive. Since then he has embarked upon a scoring spree for Northern Ireland that is nothing short of remarkable. David Healy scored his first hat trick for Northern Ireland against Spain at Windsor Park on 6 September 2006. It was an outstanding performance from Healy and an outstanding 3-2 defeat by Northern Ireland over the mighty Spanish. Six months later he notched another hat trick in a 4-1 win over Liechtenstein. This result was part of a five consecutive match scoring streak in which Healy scored a total of eight goals. He currently has a scoring ratio of 42%.